“Stay clear in your intention in the endeavors you wish to take. We, the White Winged Consciousness of Nine, are with you to assist as these intentions mold your New World. 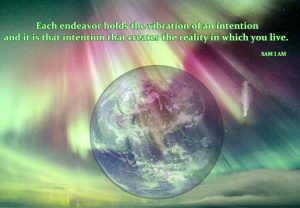 Each endeavor holds the vibration of an intention and it is that intention that creates the reality in which you live. If you intend to fill your New Earth with greater states of awareness, you must change your thought forms to reflect this state of living. 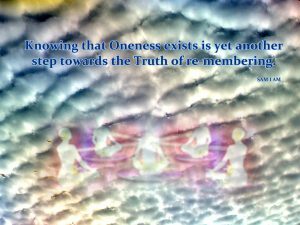 This is a step towards the beingness all ethereal forms lived in for aeons of time on the earth of old before it became filled with the gross distortion of thought forms it now rids itself of today. Comments, questions and suggestions welcome at the Contact Page.Support your Self by purchasing an inspiring bedside companion. Introducing Book Of One 🙂 Lightworker’s Log Volume 4! Visit SAM I AM Productions to support your Self and the author by purchasing books there and not through greedy corporations. Loving You! “Decoration of the New Earth has begun. We are the White Winged Consciousness of Nine here to report. Plant trees of faith in your New Earth, faith in the goodness of humanity as a whole. 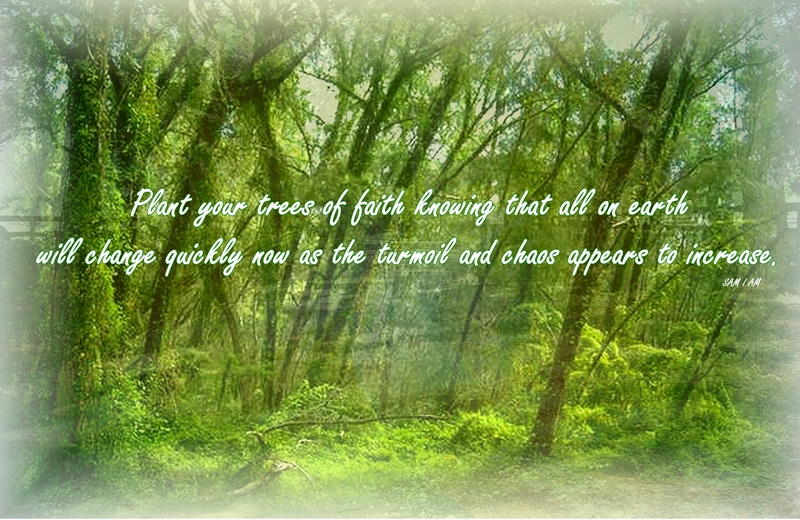 Plant your trees of faith knowing that all on earth will change quickly now as the turmoil and chaos appears to increase. Know that you and many others hold the keys to this New Earth by cementing these thoughts of faith in humanity within your New Earth. Know that as these days continue to increase to a crescendo of mass confusion those that plant these trees of faith will move further into the Oneness of which humanity truly is. Know that many upon your earth have not chosen to experience this Oneness in this lifetime. Be that as it may, all are part of this Oneness and have never truly left it for in Reality all are part of that thing called All That Is. Know that in the dark days ahead the mire of mass confusion will continue for quite some time. But those planting the trees of faith in this New Earth of Oneness will continue to reap the goodness and abundance that humanity now moves toward. Keep the faith in yourselves to do the job you have come to perform and know that all are One everlasting, eternal goodness and Light.